Buy Low and Sell High – That’s Still The Right Way, Right? It is said that the two emotions of fear and greed control most of our financial decisions (how it applies to decisions in everyday life is beyond my expertise). And as far as investment behavior goes, it’s hard to argue that emotions don’t play a critical role. And the more volatile a market becomes, the greater the likelihood of decisions becoming emotionally triggered. 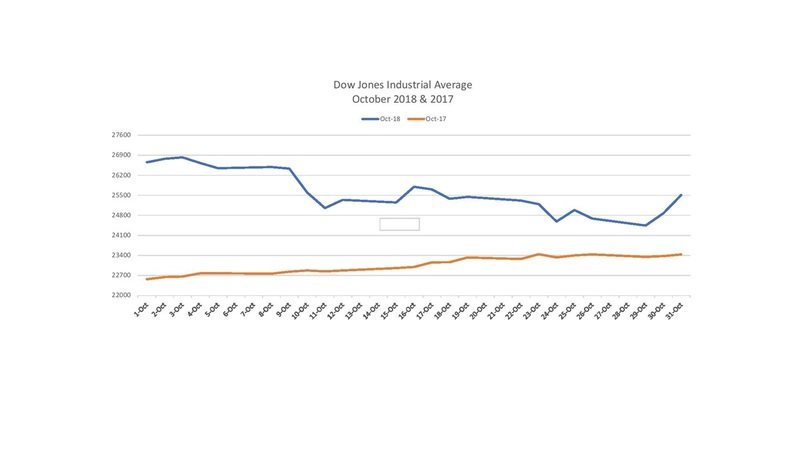 The line graph below illustrates the volatility of the Dow Jones Industrial Average Index for the month of October 2017 & 2018. Clearly, last October was far less volatile and the upward slope looks like something you would find on an optimistic sales projection chart – nice, neat, and upward sloping. Although the Dow was higher this past month than it was last year during October, the pendulum of up and down prices inevitably causes investors to make potentially questionable investment decisions. Purchase a security (investment), hold for a reasonable length of time (long-term), and then sell at a higher price. This is the ideal way investors should reap returns – taking advantage of the markets historical process of rewarding investors with returns that match their risk level of investing. 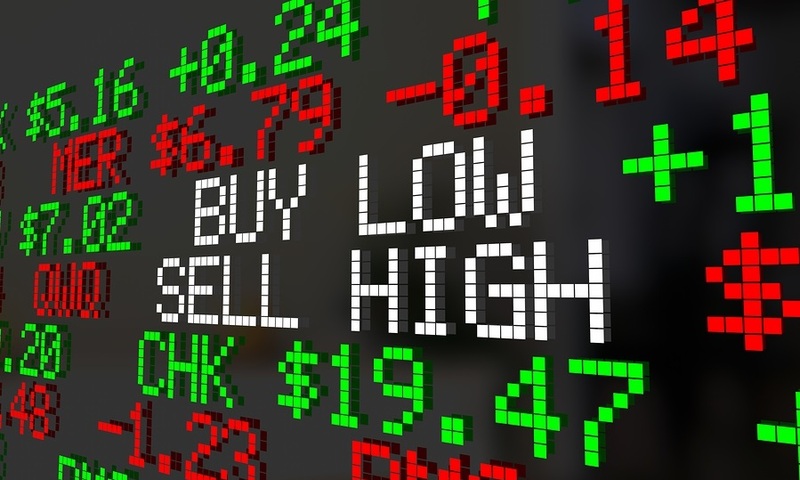 Exercising employee stock options and then selling the underlying stock at higher fair market value is another example of a successful buy-low and sell-high strategy. Buying a security when there has been a significant fall in its price. This option would appear to be the most potentially attractive path to successful investing since declines are usually temporary and the lower prices leave more room for the price to rebound. But unfortunately for individual investors, what we witness the most during falling prices is not buying - but rather selling. Typically, owning a security that is falling in price creates the natural urge to want to get rid of it. And when the price of a security that’s not owned is rising; it’s logical to want to own it. However, when it comes to the capital markets, this type of thinking doesn’t serve the best interests of investors very well. Instead of moving forward toward achieving objectives by letting the markets work for them, many investors look backward and base their investment strategies on yesterday’s news and performance. What tragically happens is they continue to repeat this cycle of buying when the price has already risen or selling when the price has already fallen – buying high and selling low -not the ideal recipe for a positive investment experience. If your original asset allocation between equities (riskier investments) and bonds (safer investments) was 60/40% (normal allocation), and the equity portion grew to change your allocation to 70/30%, then “rebalancing” would have 10% of equities sold to regain 60/40 – in essence, you’ve taken your profits – you’ve sold high, Congrats!. On the other hand, if a reduction in the value of equities lowered your allocation to 50/50%, then to regain 60/40%, an additional 10% of equities would have to be bought – following a down market! The idea of “taking your gains” during up markets sounds so much more appealing than “buy during down markets.” But that is exactly what should happen, but largely because of the fear emotion, it usually doesn’t. The value of receiving quality financial advice is not limited to helping clients make the right decisions, but it is just as valuable, if not more, to help clients avoid making the wrong decisions. Please contact us to schedule a no-charge initial consultation to discuss how our company can help you reach your goals by adopting sound investment principles – like buying low and selling high! ¹ CRSP ( 1-10 index) Center For Research in Security Prices, University of Chicago. ² Investing involves the risk of loss, including loss of principal. ³ Past performance is no guarantee of future performance.